Receiving the full value out of your decision to go with a metal roof requires having an installation team with knowledge and experience. 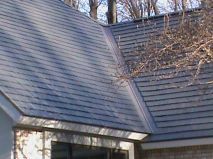 Unfortunately, as the popularity of metal roofing has increased in Michigan, so have the incidents of shoddy installations. Because of all the leaking issues, the panel coming off the garage and Huge ice dams (we never had), we are very concerned that there may be other issues that we don't yet know about.We really need someone to look at this and tell us what is right and what is wrong, what the fix is and the cost. As we have already spent almost $17000.00 on this roof, to now have problems that we never had, we are just sick about it. 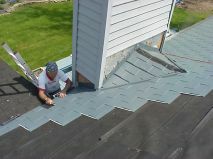 At Metal Roofs of Michigan, we have over a decade of experience of doing one thing – installing metal roofing on residential and light commercial structures. From the clean and simple ranch, to the extremely complicated geodesic dome house, we think that we have about seen and done it all. Valleys are crucial areas on a roof. Rain is not the only material falling from the sky in a state like Michigan. Leaves and snow do also. Utilizing a custom "open valley" technique assures optimizing not only the flow of rain water, but also the leaves and snow. Flashing is done at any and all protrusions. Chimneys, vent pipes, and skylights all require their own unique technique when it comes to proper protection against leaks as well as ensuring great cosmetics. What about working with an original construction design that put a field stone chimney in the middle of a valley behind a dormer? 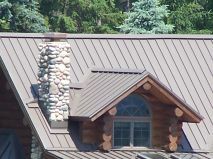 How do you work with the differing expansion and contraction issues that occur with standing seam metal roofing and log? We've done that too.